There are increasing demands for efficient maintenance of infrastructures such as bridges and tunnels in Japan, because many of them are older than 50 years. Non-destructive evaluation (NDE) is one of key technologies to detect deterioration of infrastructures effectively and save the maintenance cost. As a part of cross-ministerial strategic innovation promotion program operated by Council for Science, Technology and Innovation of Cabinet Office, SUSTERA has been developing NDE techniques using highly sensitive magnetic sensors including HTS-SQUID sensors in collaboration with Okayama University, Japan Power Engineering and Inspection Corporation, and Kyushu University. Eddy current testing (ECT) which is one of popular NDE techniques is mostly used to examine defects located near metallic material surface. Since HTS-SQUID sensors have ultrahigh sensitivity even at low frequencies which lead to longer penetration depth of eddy current, detection of deep-lying or backside defects for steel plates used in infrastructures is expected by applying them to ECT. 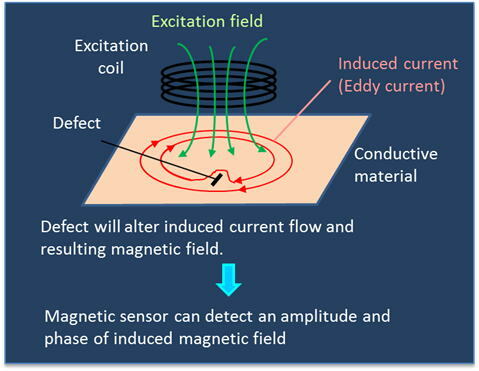 Principle of eddy current testing (ECT) method. 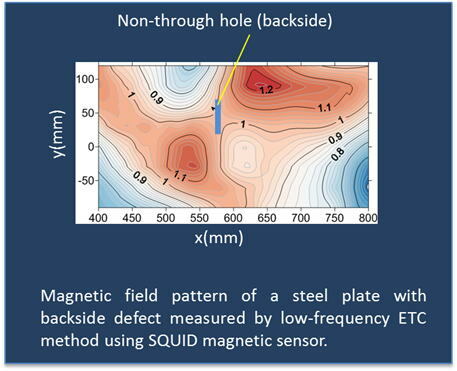 Example of detection of backside defect in steel plate by ECT with HTS-SQUID sensor.